Place all ingredients in a blender and blend until smooth. Serve right away. *If strawberries aren't in season, use frozen strawberries instead of a frozen banana. Not a morning person? Me either. 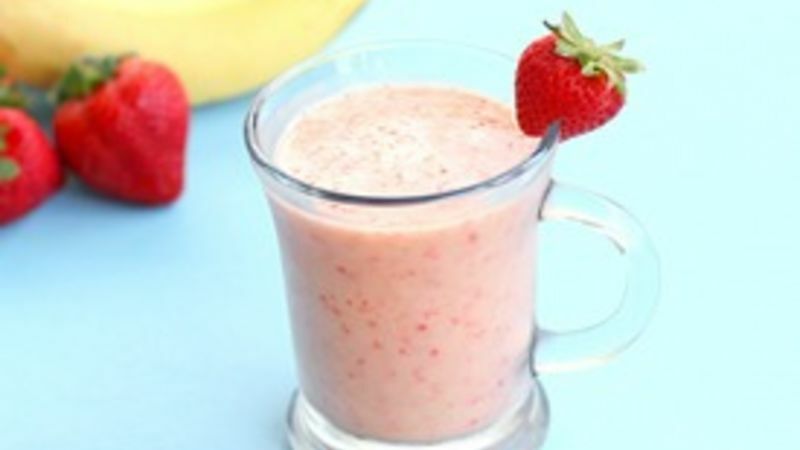 But this easy fruit smoothie recipe will jump start your day! Not all of us are morning people. Ahem. I especially take a little extra time to get going in the morning. So by the time I’m actually dressed and ready to go, breakfast is more of an afterthought as I’m trying to rush out the door. I’ve never been big on breakfast, probably because I’m not a morning person. Smoothies are the way to go for me - brainless, fast, and portable. They are perfect for sipping in my car while driving my kids to school. These Up and at ‘em Fruit Smoothies have fresh fruit and yogurt blended together for a healthy morning breakfast or even a mid-afternoon snack. Is it possible that not being a breakfast person is genetic? I have two kids that love eating a hearty breakfast of pancakes and eggs and then another who I practically have to force to eat a mere slice of apple on the way out the door. I was worried about his “brain power” at school since he would hardly eat anything before leaving the house each morning. This smoothie was the solution! It was an easy way for him to quickly drink some servings of fruit and healthy yogurt. Oh and even better, it actually tastes good so I don’t have to bribe him to drink it. Year-round goodness Sure, strawberries are in season now but not for long. You can still enjoy this smoothie year ‘round by simply using frozen strawberries instead of fresh.